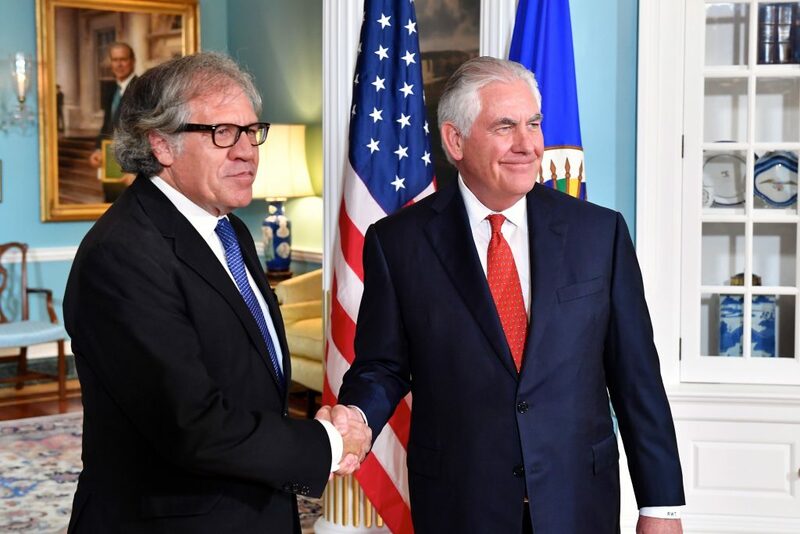 Organizations and political leaders are rejecting statements by the Secretary General of the Organization of American States (OAS), Luis Almagro, for inciting military intervention in Venezuela. “These statements are clear evidence of Secretary-General Almagro’s continual destabilization and intervention against the democracy and sovereignty of progressive governments in the region,” said the Executive Secretary of the Bolivarian Alliance for the Peoples of Our America – People’s Trade Treaty (ALBA-TCP) in a statement released Saturday. Venezuelan President Nicolas Maduro had immediately rejected Almagro’s assertions. Cuba’s embassy in Venezuela tweeted that the OAS leader is threatening regional peace and should be denounced by the international community. Bolivian President Evo Morales said the Lima Group, a bloc of right-wing Latin American governments that once had called for Venezuela to suspend its presidential elections last July, is letting Almagro call for a “coup d’état” against Venezuela. “The Lima Group rejected the military intervention against Venezuela and left Luis Almagro, slavish agent of the Empire, all alone with his coup plotting obsession. It is a defeat of Trump’s interventionism and a victory of dignity and courage of Venezuela and Latin America,” tweeted the Bolivian head of state on Sunday. The party added: “(Almagro) acts as an operator for Trump, Pompeo …, and Colombia, which just entered NATO and his U.S. military bases in its territory. ” teleSUR correspondent from Uruguay reported that the country’s communist party will ask for the expulsion of Almagro from his post. Almagro made these loaded statements days after an article in The New York Times revealed clandestine contacts between the Donald Trump administration and a faction within the Venezuelan military in an effort to carry out a coup against President Maduro.